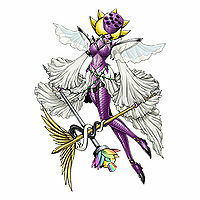 A Fairy Digimon that has an appearance like the lotus, which is said to be a flower that blooms in heaven. Its personality is lady-like in its calmness and grace, and it possesses the abilities of making people forget the suffering of this sad world and granting them good dreams. However, it will bring down its grand hammer on those that refuse that good will. 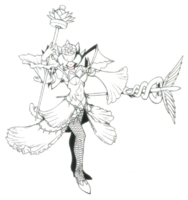 Its Special Moves are released from the Caduceus, which is held in its left hand and administers restoration and devastation, as a white aura (Serpent Cure), and a black aura (Serpent Ruin). 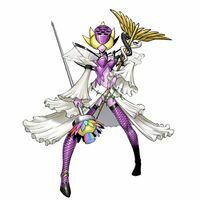 Also, a seven-colored aura is released from the staff of rainbow-colored flowers that is held in its right hand (Seven's Fantasia), and this makes the opponent completely lose its fighting spirit by tempting it into a euphoric fantasy world. | Lotus 「ロトス Rotosu」 is a genus of plant. The name spelling originates from Latin lōtus which is derived from the Greek word lōtos (λωτός). 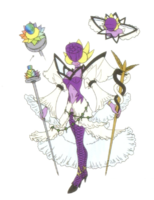 Seven's Fantasia  セブンズファンタジア Sebunzu Fantajia Fires a rainbow-colored aura from the seven-colored flowered staff it carries in its right hand, luring its opponents into a world of euphoric fantasies and causing them to completely lose their fighting spirit. Serpent Ruin  サーペントルイン Sāpento Ruin Fires a black aura from the caduceus it carries in its left hand which governs ruin. Serpent Cure  サーペントキュア Sāpento Kyua Fires a white aura from the caduceus it carries in its left hand which governs recovery. 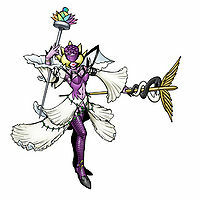 Can be evolved from Lilamon At least level 57, Insect/Plant EXP 29000+, must have Befriended Rosemon. 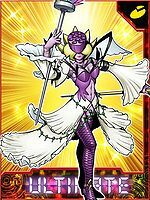 Can also be obtained by jogressing Blossomon with Lady Devimon if at least level 52, Insect/Plant EXP 22000+, and must have Befriended Rosemon. Lotusmon is only obtainable by Lalamon's DigiTama, unlocked by password. 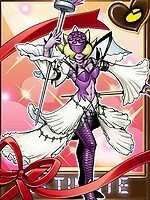 This page was last modified on 29 December 2018, at 04:01.